Mormon Doctrine, by Bruce R. McConkie, was written in 1958. 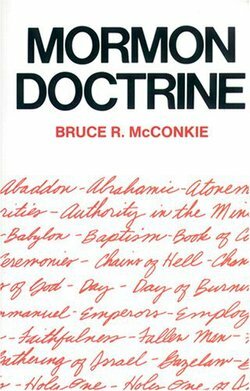 It was written when Bruce R. McConkie was a Seventy, a position of authority in The Church of Jesus Christ of Latter-day Saints, but lower in authority than an apostle or prophet. The book was written without review or guidance from church leaders, and included a notation from him that he was entirely responsible for its content. The book has never been an official source for church doctrine. What is an official source? "Understanding 'Mormon Doctrine' and Bruce R. McConkie requires understanding Joseph Fielding Smith [Bruce R. McConkie's father-in-law]. Called to be an apostle in his early 30s, he served for 62 years. For 19 of those years, he was the president of the Quorum of the Twelve. His authority was towering and his zeal was significant. His encyclopedic 'Answers to Gospel Questions' was compiled from decades of doctrinal questions he answered in church publications. "The great compilation of his teachings is titled 'Doctrines of Salvation' and was edited by Bruce R. McConkie in the years immediately before the publication of 'Mormon Doctrine.' Joseph Fielding Smith was a man who ate, breathed and slept doctrine, and Bruce R. McConkie was his protégé. "Bruce R. McConkie was continuing a tradition of the family he had married into. He was also teaching and testifying of truth in the bold, declarative manner of his culture and personality. "During the 13 years of his apostolic ministry, Bruce R. McConkie was beloved by the Mormon people. His distinctive voice and unshaken certitude were the hallmarks of a generation. His final General Conference address, a powerfully sacred testimony, was given just days before his death. "But Bruce R. McConkie wasn’t politically correct then and he isn’t politically correct now. His unwavering certainty bothered those who didn’t share it, and those whose faith could not match his questioned and mocked it. "Bruce R. McConkie was in the positions he held, for the decades he held them, because the Lord wanted him there. He was every bit as much an apostle as anyone else in the quorum. He was called by God and sustained by the church. There is no such thing as a lesser apostle. "Nor is there any such thing as an infallible man, and there may be random errors in Bruce R. McConkie’s writings. He may also have sometimes stepped on people’s toes – inadvertently or on purpose. But he honored his priesthood and he magnified his calling. And he did what he set out to do – he boldly declared the doctrines of the Mormon church." Often in his book, McConkie declared the meaning of prophecies from the Bible, or stated his own opinions. Because of his very authoritative tone, which left no room for other opinions, people assumed that everything he said was owned by the Church. Yet, McConkie's disclaimer is there at the beginning, that this was his own work and his own opinions, and not those of the Church. This page was last edited on 16 September 2010, at 15:03.